Continuity mistake: When Ness is "escorting" Nitti off the roof of the courthouse, watch the proximity of the two to the rooftop door. When the camera cuts from the edge of the roof to Nitti and Ness and then back to the edge of the roof, you can see that they went from close to the rooftop door to really far away from it. Factual error: In the warehouse scene with the wooden crates with maple leaves, even though a correction has been submitted saying a maple leaf was valid, the real mistake is the type of maple leaf used. The film shows a modern graphic style of leaf that did not come into use until the 1960s and appeared on the new Canadian flag in 1965. In the time of Capone, the maple leaves used to depict things Canadian looked like actual maple leaves and not like a stylized graphic. Continuity mistake: When Ness and Nitti are fighting on the roof of the courthouse notice the sky. It is clear, then cloudy, then overcast then clear, etc. Continuity mistake: When the four untouchables charge, Agent Stone and Agent Wallace run to the bridge off their horses, whereby Agent Stone gets shot in the left arm. Later, back in the police HQ, his left arm shows nothing of a bullet passing through or bandage. Continuity mistake: In the train station, where Ness is trying to catch the baby carriage, he shoots a gangster when the man makes a charge from behind the pillar. The bullet clearly hits the gangster's left arm (at least blood squirts from there), but when in close-up the gunshot wound is in his chest. Continuity mistake: When Ness and Malone are shooting at a gangster car on the bridge coming towards them, they blow out the left headlight. The shot changes to them firing and back to the car. When it cuts to the car for the final time, they shoot the left headlight out again. 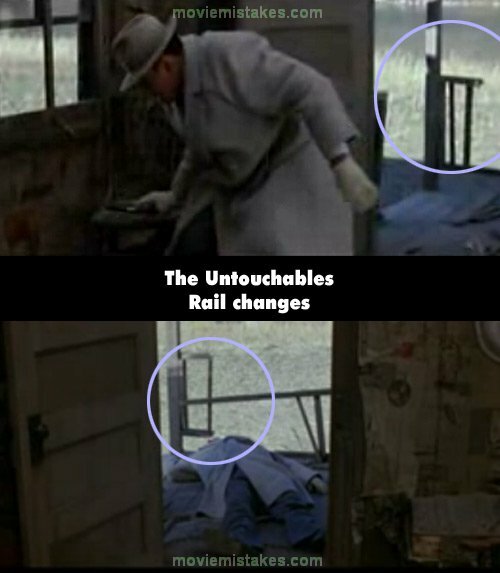 Continuity mistake: When Al Capone has sent hit men to murder Malone, he is shown going from one room to another, alternately, from outside and then from within his apartment. When the shots are taken from outside, the camera pulls up tight to the outside window. You can see the cameraman on the crane. Continuity mistake: After the death of Wallace, when the three remaining Untouchables are gathered, Stone says to Ness that he requests to stay (or something similar). Then he walks off several steps away from Ness and passes into the kitchen. The shot changes and suddenly he's only a step away from Ness. Factual error: We see a British double decker bus on the streets of Chicago. The first Routemaster double decker bus was first introduced in 1956 so the existence of such a bus in the 1920's is impossible. Also, given its UK layout, designed for travel on the left side of the road, any passengers getting off would do so into the middle of the traffic. 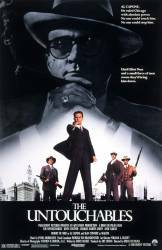 Factual error: The film shows government agent Eliot Ness throwing Al Capone's right-hand man, gangster Frank Nitti, to his death from the roof of the Chicago courthouse in 1929. It never happened. Frank Nitti died of a self-inflicted gunshot wound in 1943. Suggested correction: The movie was not meant to be exactly like real events. The movie was loosely based on the events (aka "inspired by actual events"). There are a lot of differences between the movie and the real events, these were done on purpose, to make an exciting movie. That's a lame excuse. There are lots of opportunities to embelish on the truth when dealing with a historic topic. The station scene with the baby is an excellent example of that. But, you can't go changing the relationships of main characters or the time and methods of their deaths. Especially ones so well documented like Capone and Nitti. Why even bother using real names? The character they called "Nitti" was just a completely made up character. Nothing about him resembled the actual Nitti. Nitti wasn't skinny and he didn't wear white suits. He wasn't a loner, often scene hanging with his crew. Nitti was an exceptionally short man with a Chaplinesque moustache. Always jovial for the cameras. It's simply your opinion that it's a "lame" excuse. The fact is the film is highly fictionalized. It's not a documentary, it's a drama. They combine and eliminate characters, give them different names and characteristics, and show events that never happened. These are not mistakes, they're known as creative license. They would only be mistakes if they film claimed everything in the film was true and accurate to history. Continuity mistake: During the shootout on the rooftop, there is a point when Ness is above Nitti who then starts shooting. He hits 2 glass bottles next to some sort of bucket. However, in the next shot of Ness this bucket has simply vanished. Continuity mistake: Ness has been leaning over Malone who was laying on the floor of his apartment shot up and bleeding profusely. Some blood shows up on Ness' overcoat but when they go to the train depot there is no sign of blood anywhere. Since there was no time to change where did the blood go? Continuity mistake: When Nitti approaches Malone's house he checks the address in his match-book, and there are no matches on the right side. In a later scene in the courtroom, Ness takes a book of matches from Nitti, opens it and sees the incriminating address. This time there are matches on the right. Continuity mistake: Just after Ness sends his wife and daughter to a hidden place, he and Wallace are standing in the middle of the street, when a car approaches with Malone and Stone in it. They both get off the car and run to join Ness and Wallace, who are about five steps away. When the four agents go back to the car, they have to run about twenty steps, when they were supposed to be only five steps away from it. Audio problem: Ness grabs a man who's trying to blackmail him and throws him out of the office. When he does, his voice changes abruptly, much cleaner, obviously overdubbed, and the sentence "You tell Capone that I'll see him in hell" is heard but Ness doesn't mouth it. Continuity mistake: In the scene where George and Wallace enter the elevator with Nitti, the elevator doors are facing the interior of the police station. There is no visible second set of doors on the back (exterior side) of the elevator, or a second set of buttons. Nitti turns and shoots George and Wallace, leaving their bodies slumped against the back (exterior side) of the elevator. By the time the elevator arrives at street level, it has done a 180 degree turn, with the doors then facing the exterior of the building, where Nitti can exit directly to the street. The doors are not just hidden when closed, because the bodies are then slumped against what would be the interior side of the elevator, and the only set of buttons is now on the exterior side.